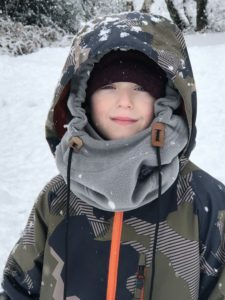 All the way from Essex, UK this 8-year-old competitive ski champ is making moves and on his way to becoming a professional skier. Palmer is one of our amazing mini-ambassadors and we love seeing him excel in his sport! Palmer is a skier to watch — pretty soon you might see him shred on TV! WinterKids: How old were you when you first started hitting the slopes and who first taught you how to ski/snowboard? Palmer: I was 3 when I had my lesson at an indoor slope in the UK. I’ve been lucky enough to ski in the Alps in Europe a few times now with my mum and dad. Now, my coaches, Nick and Dan help me at my home slope each week. WK: Where is the coolest place you’ve ever ski/snowboarded, what did you love about it the most? Palmer: The best place was Laax in Switzerland this Year where I competed in the British Championships. I loved trying the super pipe for the first time and I got bronze in under 12’s in slopestyle. Everyone I ski with in the UK was there so it was an awesome week! WK: What is your favorite ski/snowboarding trick, how long did it take you to learn? Palmer: My favourite trick is a 540 with a grab. It took me about a year to learn- I’ve been doing 360 spins for ages. Thanks for my rail photos Dave Allen @kendalsnowsportsclub last week @thesnowcentre @skatepro.wintersports @skatepro @summit_worldwide @burntcustard @winterkids @demonunited #flexicoverinsurance #skatecruiseride #demonsaves @cerys.allen @jibworx #skiandboardbros #snowbros Dave? WK: What is the next challenge or trick in your sport you’re working on? How is it going? Palmer: I’ve just started throwing front flips on skis after 6 months of doing it on a trampoline. I’m still landing on my back a bit but I’m going to get it soon… next I’m after a misty 5. WK: Who is your ski/snowboarding hero and why? Palmer: Definitely James Woods. He’s a world-class skier who learnt on a dry slope in Sheffield. I met him this year in Laax and he dropped in with me. Best day ever. WK: What is your favorite thing to do in the off season/summer time? Palmer: Well, I still ski all summer because we have dryslopes and indoor slopes here. I meet my friends every week. I also like skateboarding and gaming. WK: What are you doing when you’re not on the slopes? Palmer: I play my x-box and play out. WK: If you could have any superpower, what would it be and why? Palmer: Do any trick and never fall! WK: Do you have any tips for kids or adults who are just starting out in the sport? Palmer: Send it! It’s got to be fun with your mates. Also, don’t forget to get some decent back protection if you’re riding rails or the kicker. WK: What do you want to be when you grow up and why? Palmer: I’d like to ski for a job. It’s doing what I love and getting paid for it! WK: Anything else you would like our readers’ to know about you? Palmer: I’ve got a baby sister. Apparently, I’m meant to teach her to ski soon! Thank you Palmer for talking with us! 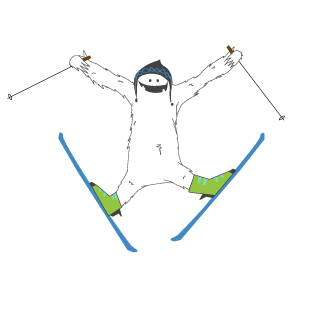 We love seeing you make progress towards your goal of becoming a professional skier. Can’t wait to see you at the Olympics in no time! Thanks for my rail photos Dave Allen  @kendalsnowsportsclub last week @thesnowcentre @skatepro.wintersports @skatepro @summit_worldwide @burntcustard @winterkids @demonunited #flexicoverinsurance #skatecruiseride #demonsaves @cerys.allen @jibworx #skiandboardbros  #snowbros Dave?